Day One of Blue Ridge Parkway ride. 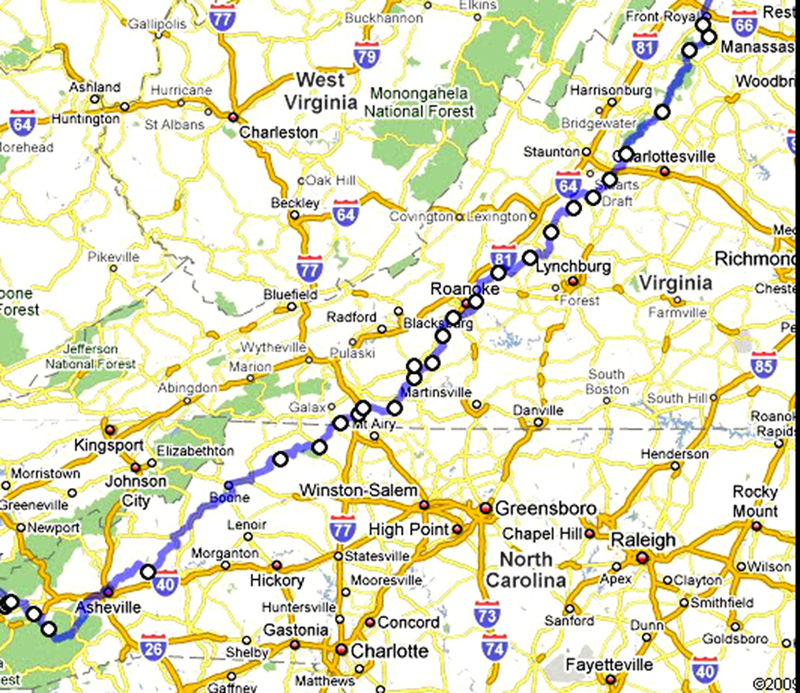 I left Biltmore at 11:30 AM and onto the parkway just outside the town for about 20 to 30 miles. I was getting dizzy from so many curves and had to get off and take regular roads to get over to Boone, N. C. I had thought that Boone was a small town but was surprised when I came around a bend in the road and saw the size of the town. It was huge. The sign said that the population was 20,000 people. I had reservations at the Super 8 Motel in town. When I pulled into the lot I found the hotel had five floors and saw people arriving in limousines. When I checked in, still in my leathers, I was not even given a second glance and this surprised me. As I walked into my room on the 5th floor of the hotel, a rain began, coming down so hard that I could not see across the street. Today was my first day on The Blue Ridge Parkway. I found out that only cars, RV’s & motorcycles are allowed to drive on the parkway. There are very few gas stations on the parkway itself. To get gas you have to leave the parkway and ride into a near by town. I checked around for a local restaurant that had excellent food and was directed to the Boone House, which was close by. When I left the hotel to go to the Boone house it was still raining so I put on my rain jacket and walked over to the restaurant. I was wearing my deals gap T-shirt that had a tail of the Dragon on the back. This drew some attention from the family that was sitting next to me. They called me over and asked if I had been to Deals Gap to which I answered yes. They were heading over tomorrow and wanted to know what to expect. So I spent a little time with the family talking about my experiences, then I sat down had my meal said goodbye. As I left, it felt like an excellent day. Tomorrow’s trip to Galaxy was a short 80 miles or so I had to leave the hotel between 8:30 and 9:00 AM. Storms were predicted for tomorrow so I made sure my rain gear was ready before bed.